If there is anything that those of you who read our blog or follow our facebook page have hopefully noticed is that I am a positive person. My positivity remains a defining characteristic, despite the events that took my little boy from our world. It is certainly more difficult to remain positive under such circumstances, and nearly impossible to do it alone. Thankfully, my family and I never found ourselves in a position where solitude was forced upon us. It was the kindness of others that lifted us out of our despair and restored us. The generous acts of people both familiar and strange helped bridge the gap between hope and despair. It was these acts, both big and small, that opened my eyes to the power of human kindness and its ability to lift the spirit from deepest depths. It was these acts, not the tragedy itself, not the tragedy of losing Rees, that lead to the creation of ReesSpecht Life. ReesSpecht Life started with Bill Kelly of Kelly Brother’s Landscaping standing at my door asking if there was anything he could do to help… and help he did. Not only did the Kelly Brothers take our drab yard and beautify it in a way I could never have on my own, they removed the one reminder of that awful moment. They would not take any money. They would not allow me to put up a sign advertising their work. They did it because they could and that is the essence of kindness. ReesSpecht Life started with a colleague named Michelle who came over the next morning with a lasagna. She never saw me, but I heard her. I knew she was there, I just could not face anyone at the time. She did it because she could and she knew it would help feed us when we were unable to do so ourselves. ReesSpecht Life started with my family who found a way to travel around a superstorm to be at my side when I needed them the most. They did it because they could and they knew I needed their love. ReesSpecht Life started when my Aunt Barbara, who lost so much in her life including her own young son and her husband, showed up at my side to hold my hand and tell me that it will get better, but maintained a necessary honesty with me about how it would impact my life. My Aunt did that because she could and she knew what I was going through. ReesSpecht Life literally started when my friend Brian from work heard me speak at Rees’ memorial and was inspired by my words and apparent “strength”. Brian gave me the idea (and the name) for a foundation based on a play on Rees’ name and the words I spoke that night. Brian said that to me because he could and he knew it would give me something to work for in my son’s memory. ReesSpecht Life started when my High School Choral teacher, Mrs. Linda Contino, came to sing at Rees’ memorial. A woman with whom I held in the deepest respect and admiration took the time to do what she knew would help heal my soul, even though I had not seen her in almost 20 years. She did this because she could and she knew her music would lift our souls closer to Rees at that moment. ReesSpecht Life started when countless numbers of my former students, friends, colleagues and even strangers braved power outages and gas shortages to flood the funeral home and block traffic on route 25a to honor Rees. They all did this because they could and they knew their presence would remind us of how much they care. All of these things, and really so much more, are what started ReesSpecht Life. 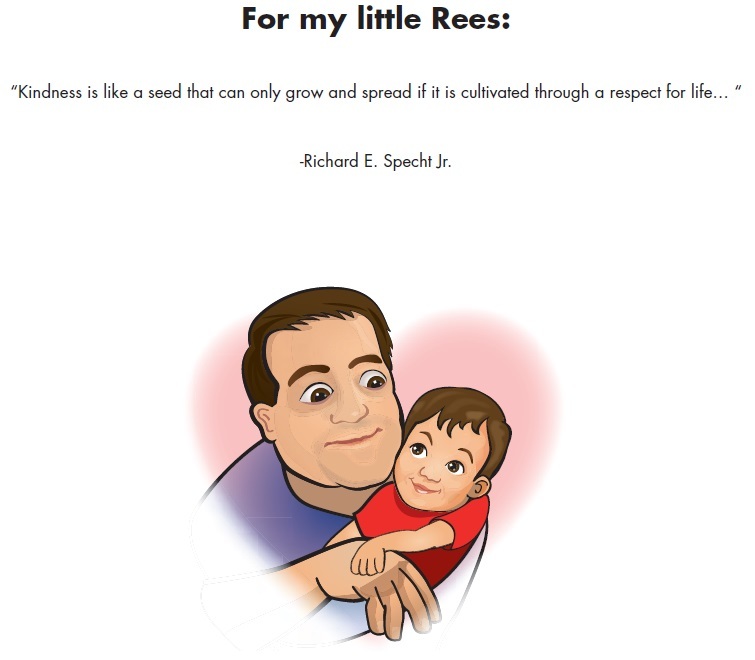 ReesSpecht life was not born out of the tragedy of child loss, it was born out of the spirit of human goodness and kindness. All I want to do is spread that kindness. I am obsessed with it. It literally occupies my thoughts nearly every moment I am awake. The “pay it forward” cards are a direct result of this obsession and it feeds directly into my scientific mind as it represents something that I quantify. 40,000 cards – each representing a potential act of kindness… that just blows my mind. Every act of kindness from those cards can trace its genesis to those acts that started this in the first place. When I get down at night, I think to those cards, and the people they have touched and I smile. I smile because I know that the spirit of my little boy has touched these people and their lives were made better, however slightly, by the fact his spirit endures. Nighttime is the hardest for me. It is when I find myself alone with my thoughts and invariably memories of Rees pop into my head. Sometimes I smile and other times I cry most times I do both. Regardless, nearly every night finds me in the same place: sad at the loss of my little man and happy at all the kindness spreading in his name. It is in those times that I begin to fear that one day the movement, like all things, will fade away and die and it will all be for naught. It is in those times that I tell myself that I need to live in the present and be happy for what we have done and just hope that we can continue to do more. Almost every night ends like that for me, except for last night. Just before I went to bed last night the illustrator for our children’s book, the amazing Adam Smith, sent me over 15 of the completed illustrated pages of the book. When I opened the book and saw the finished product I was awestruck. Adam managed to capture the images I had in my head and place them on the pages I was looking at. More importantly, he captured Rees’ spirit in his illustrations in a way that made him feel alive to me. My story, written from the heart and staring Rees, came to brilliant life and I cried the happiest tears of my life. In front of me was the legacy of everything I was trying to accomplish with ReesSpecht Life. I was witnessing the spirit of Rees and his message of kindness come to life in front of my eyes. It was in that moment that I realized that one day all of the “Likes” on facebook would be no more, entropy will tear apart every ReesSpecht life card and the money from all of the scholarships will eventually be spent. All of those things will eventually disappear, but the book and it’s art will live on long after. It was in that moment that I realized that my dual goal of establishing my son’s legacy and spreading kindness in his name will go on long after I am gone. It is a unique experience to devote your life to something that has the greatest meaning to you and, in many cases, merely catches the eye of other people. I believe that any parent can relate to this feeling as it is much like having a child… to you that child means the world – and to others, especially those not related to you, that child’s importance in those individual’s lives is not even remotely commensurate with your feeling toward them. This is precisely the feeling I have with ReesSpecht Life: it is our baby that means the world to us, but represents an intriguing distraction to others, but does not have remotely the same importance to them. My fear is that once another distraction comes along those who do not share our attachment to the cause will simply forget us (and my boy by association). The fear of loss is eerily similar to the protective fear every parent has for their children. This fear is of course compounded by the fact I have already felt the immeasurable loss of my little boy. I don’t want to lose this, but the grim reality that we can, and do, lose the things we love the most is always there in my mind. I am painfully aware that all the care and preparation one can take can never guarantee the safety of the things we hold most dear. At this point I could allow my fears to overtake me and give up… or I can do what I have done since we lost Rees: take the obstacles that life has thrown at me and grow from them. I choose the latter. I realize that the likes on our facebook page have slowed to a trickle, but the optimist in me also notes that the weather outside is getting nicer and people are less likely to be on their computers right now. I fully expect us to continue our growth and I will continue to spread this message: even if I represent the last Rees’ piece. My Boy left me with a mission. I am not stopping, I am not giving up. He would expect nothing less, and now, neither will I. ReesSpecht Life.